Revere High School English teacher Nancy Barile. 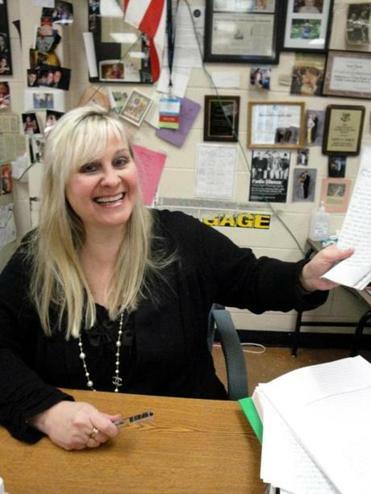 Nancy Barile , a Revere High School English teacher, was shocked to find out she was one of seven teachers from across the country selected to receive a Kennedy Center/Stephen Sondheim Inspirational Teacher Award . What really touched her, though, was that the nomination came from Merzudin Ibric, a former student who nearly gave up on school. Barile said she didn’t consider the honor small. “I bawled my eyes out. It just really touched my heart,” she said. When Ibric was a sophomore at Revere High School in 2003, he decided he would drop out. A Bosnian war refugee living in a rough neighborhood who was still mastering the English language, Ibric didn’t think school had much to offer him. Barile insisted that Ibric stay in school, and encouraged him to try out for the track team. From there, she coached him through getting his grades up, helped him get into prep school, and mentored him through college scholarship applications. A few months ago, Ibric, a Wheaton College graduate, discovered a way to honor his teacher and mentor. He submitted an essay to the Kennedy Center in hopes of giving back a little bit of what Barile gave him. “ ‘You survived a war! This is a piece of cake.’ These aren’t the words of a poet or philosopher. They are the words of my teacher, Ms. Barile, and they inspired me to achieve great things,’’ he wrote. A panel selected Barile from hundreds of other nominations based on Ibric’s words. Barile said she was excited to be recognized as an inspirational teacher and was overwhelmed to receive the Kennedy Center/Stephen Sondheim award’s $10,000 grant. Barile, who has been teaching in Revere for 18 years, said she loves her job and prides herself on teaching beyond the classroom, as she did for Ibric. “I think when students realize you care about them and you’re investing in them, they’ll thrive,” she said. She said she tries to make material relatable to her students when she teaches, breaking down challenging works like Shakespeare’s “Macbeth’’ into understandable emotions like love, ambition, and jealousy. “The most important thing is having the kids connect to the learning and making it relevant to them,” she said. Barile also takes some students outside the classroom to give those like Ibric an understanding of what the world can offer. She leads the high school’s Culture Club , a group that celebrates all cultures and takes monthly field trips to plays, museums, and operas at no cost to the club members. “My students have probably been to more performances than the average adult,” she said. Barile said former members have told her they gained a new perspective from her efforts. “They didn’t feel like they were lacking that experience when they went to college,” she said. Barile is a mentor to many students, sometimes coaching them throughout their college experiences and first jobs. In addition, she advises about three new teachers every year. Barile said the pride she feels when seeing her students succeed is comparable to what a parent feels. “I was meant to do this,” she said. Ibric considers Barile a lifelong mentor to him. He said the biggest thing Barile taught him was to be positive.